WhatsApp is one of the most popular instant messaging client, which is available on all major mobile operating systems. WhatsApp has partnered with Google to allow users to create a private backup of their chat history, voice messages, photos, and videos in Google Drive. Of course: you don’t want your memories stuck on your phone. (What if something happens?!) So starting today, WhatsApp for Android lets you create a private backup of your chat history, voice messages, photos, and videos in Google Drive. And once you do, you can restore everything on a new device with just a couple taps. Later, if something happens to your device or you decide to replace it with a new one, you can easily restore everything on WhatsApp from Google Drive in a few simple taps. 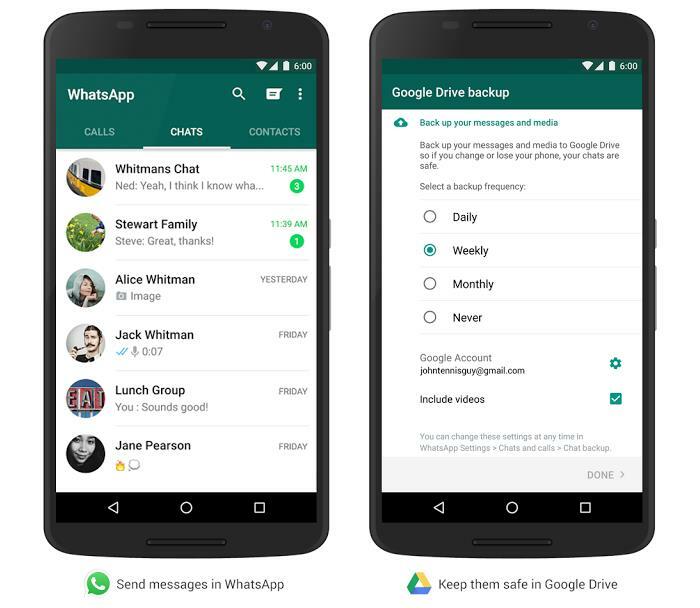 You can simply enable the feature in your WhatsApp and select the frequency at which you want the app to backup your messages and content to Google drive, whether its daily, weekly or monthly. The new backup feature is available for Android, and is rolling out over the next few months. So make sure to keep an eye on your WhatsApp settings to see if it’s available. Let us know if you can see the new backup options on your device.